My problem was that I looked about 12. I waved my press card in their faces, but to no avail. A few minutes later, City Hall’s glass doors flew open and my then-editor Ari Rath (who along with Ofer and Asher Yadlin hailed from Kibbutz Hamadiya) peered out and called to the officers: “It’s OK, this child is with me.” My embarrassment was now complete. As a Dan Region resident, my aim was to find employment in Tel Aviv, but I somehow had the presence of mind to first approach the head office in Jerusalem. There I met duty news editor Charlie Weiss, who looked up briefly with his very blue eyes and upon hearing that I was thoroughly bilingual, asked if I had time to cover the Jerusalem Municipal Council session that was slated to begin in 15 minutes. Mayor Teddy Kollek was supposed to settle some political score there. It seemed peculiar. Charlie asked me no other question. I was too green and too eager to be wary, never mind to recognize that I was being … exploited – sort of. Charlie was short of reporters and I serendipitously walked in off the street at the last moment. He merely took advantage of an opportunity. From his vantage point I was better than nothing. I didn’t understand then that Charlie wasn’t even testing me. I didn’t know that bilingual staffers were hard to come by and, when found, were kept on as reporters for as long as feasible. Desk jobs could go to new immigrants whose English was fine, but whose Hebrew was atrocious. They knew a lot less than reporters, a fact which skewed the paper’s hierarchy and triggered conflicts aplenty. But being naïve, I went, heard Kollek, took notes, came back and wrote my report. That inspired Charlie’s second and last-ever question to me: “Why didn’t you tell the story chronologically?” I answered that I thought I should start off with the most interesting tidbit to capture the reader’s interest. He hired me then and there. Were it not for the absence of fly-paper, I could swear that I had stumbled into a ramshackle establishment deep in the Mississippi boondocks. Mac sat in his undershirt, with his feet on the desk, swaying to the rhythms of “Hang down your head Tom Dooley.” I was greeted with an American-accented dirty joke and Mac’s promise to “make a man of this little girl.” I was also forthwith nicknamed “Buttons” because of the shape of my nose. The Tel Aviv office was then located in the heart of town – on the corner of Nahalat Binyamin and Yehuda Halevi streets, right behind Allenby Road’s old central post office, an urban landmark in its day. I found myself in a vibrant newsroom, unlike anything in existence in this age of hi-tech gadgets which spare reporters the need to ever put in an appearance, and which facilitate filing from anywhere. Although spacious, our newsroom was crammed with rickety wooden desks in varying stages of disrepair. On each was perched a typewriter, each a relic of a different era. My first one was a genuine antique – an American Underwood with see-through glass sides. It was followed by a Hungarian wonder, whose keys featured non-English instructions, sufficiently suggestive of four-letter English expletives to elicit nonstop hilarity from Mac. In time I would learn that these exemplars of yesteryear’s technology actually put the Post right on the cutting edge of the day. In Davar, for instance, they kept on scribbling by pen, well beyond the advent of the personal computer. 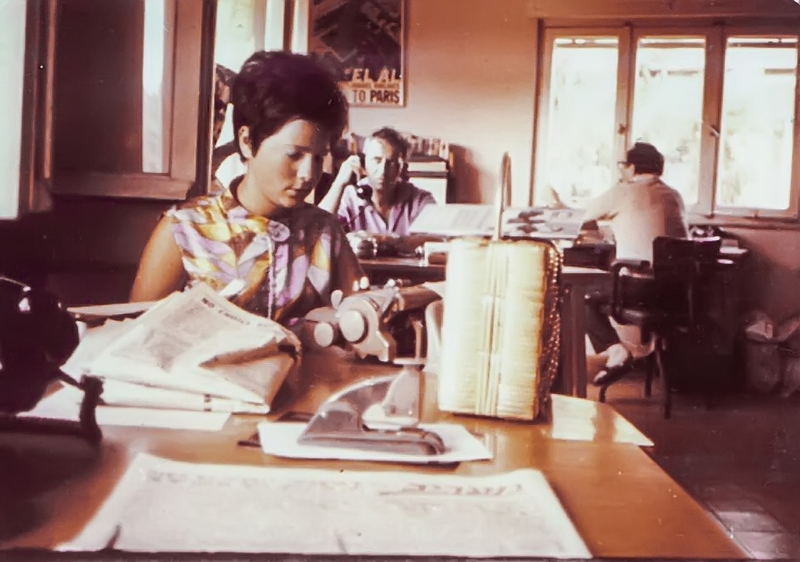 The Post, in fact, would – years later – become the first Israeli newspaper to resort to computer innovations, and I’d become the first Israeli journalist to work from home before the Internet. That was after I had given birth and was legally due leave time, but my editors decided they couldn’t spare me – the law of the land notwithstanding. They had our Washington stringer smuggle through customs a RadioShack Tandy which showed one line of text only at a time and had no hard disk. It featured a flexible cup contraption that fitted over the mouthpiece of the telephone (landline, of course) to transmit scant amounts of data. I was left with a thick instruction manual which I had to master on my own. In time, word got round to the Journalists Association and I was roped into teaching numerous other reporters, on many other news outlets, how to use the rudimentary harbingers of today’s laptop. But I’m getting way ahead of myself. Back in the antediluvian day, long before the microchip and printed circuits came to dominate our lives, what placed the Post in the technological vanguard more than anything else was our in-house telex setup. It was necessitated by the fact that we had to send our material to the news desk in Jerusalem. This was another Jerusalem Post anomaly. In those days 80 percent of our news copy was generated in Tel Aviv, but was edited and printed in Jerusalem. This imposed on us – the only Jerusalem-based daily – much earlier deadlines than those of all the other Israeli papers. We had to get our final product down to Tel Aviv in time for distribution with all the Tel Avivian Hebrews. Transcribing texts by telex was the exclusive preserve of Indian-born Aharon Khermoush, who ran his royal realm high-handedly. He was one of those uncommon types who could forever remember any phone number he ever came across and could spell flawlessly (while the then-obligatory British spelling, usage and idioms bedeviled many of us). He had a field day with each of our typos and announced them crowingly to the entire newsroom. “Can’t spell, can’t spell,” he’d roar with relish at Mac, who could always be counted upon for a clever retort. Next on the funny-bone tickling scale was our late military correspondent Ze’ev (Wolfgang) Schul who daily regaled us, in detail, with tales of exploits we never heard of (and never quite wanted to hear). Ze’ev was the macho-man of the bunch and the one who called me Meida’le (little girl in Yiddish) in addition to Buttons. It emerged that we lived in close proximity, which meant that he would drive me home before I got my own license. Ze’ev, a Yekke transplanted in his youth from Germany to the Galilee village of Migdal, was one of the most dominant and effervescent voices in our newsroom. The repartee between him and Mac kept most of us in stitches, but not Mark Segal. Mark, my political guru, was a pedantic writer, always searching for the perfect pun or turn of phrase. The newsroom’s juvenile hijinks interfered with his concentration. “Can’t we have some decorum around here?” he’d repeatedly exclaim in his British intonation. Inevitably, this only made Mac and Ze’ev all the more boisterous. Mark seemed unwelcoming when I first walked in. “Oh, that’s just what we need, a little girl,” he sneered. In time, though, he became a fixture in our home. He was a frequent visitor, mostly unannounced. He came over and sat around with my parents. He exchanged recipes with my mother, which was odd, because she wasn’t much of a cook and couldn’t stand the kitchen. But no matter, Mark was soon part of the household and the mentor to whom I’ll forever remain grateful. However, he’s not the only one I owe so much to. Sraya, jaded by the time I showed up, did his darndest to avoid assignments. On my second day in the Post’s Tel Aviv office he dumped on me the task of covering a speech by then-premier Levi Eshkol. Sraya thereupon recommended to all and sundry that I should do politics. But it was hardly that obvious to others. In those pre-politically correct times, the Post actually featured a “Woman’s Page.” The assumption was that politics constituted a male domain. This was despite the fact that editor Ted Lurie’s deputy was the remarkable Lea Ben-Dor, whom I admired unreservedly and who would herself assume the Post’s editorship in 1974. But she was considered a singular case, apart from other females – much like Golda Meir in Israeli politics. 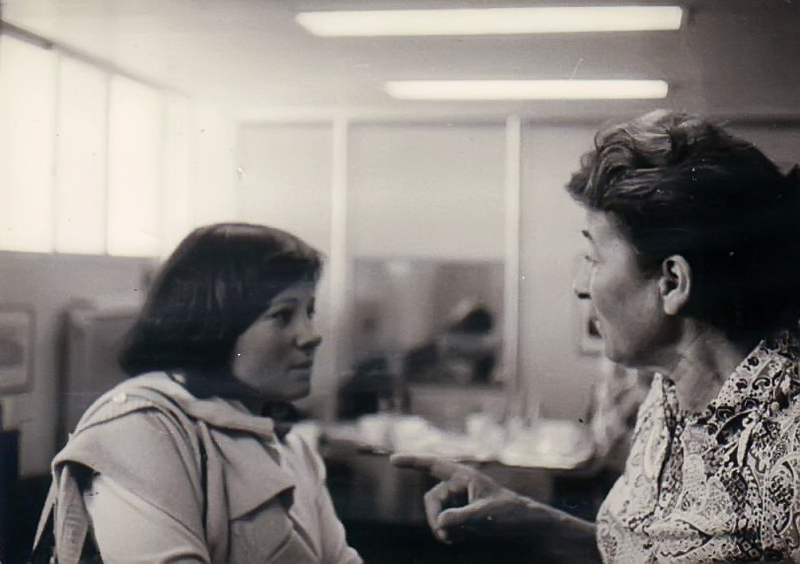 The Woman’s Page was run by the indomitable Helen Rossi in Jerusalem. 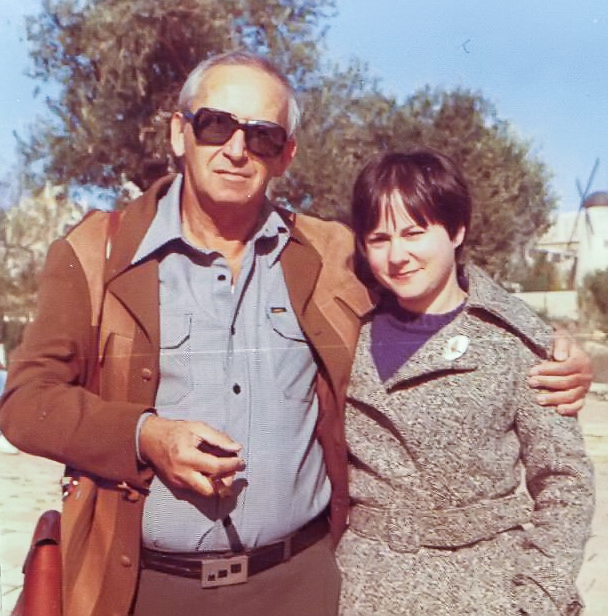 Her Tel Aviv second-in-command was Helga Dudman, as nonconformist a character as anyone is likely to meet – except in her conviction that gender had earmarked me incontrovertibly for the Woman’s Page. Despite my protests, Helga dispatched me to cover a fashion show organized by Ruth Dayan. I couldn’t care less and my copy reflected it. Our consumerism expert, Martha Meisels, worked with Helga and Helen, but understood me wholeheartedly and backed my resolve not to be boxed in against my will. Martha would spend untold hours researching the minutiae of a newfangled laundry detergent or breakfast cereal. She became a formidable authority of the sort Israel hasn’t known since her premature death in 1995. There just never was anyone else like the accomplished Radcliffe alumna whose “Marketing with Martha” column remains legend. In those early days she also had many news beats that I took over before she went on maternity leave. But consumer affairs remained her select specialty. No one was temperamentally suited to follow in her footsteps. We quickly bonded, became fast friends and when, a couple of months later, Martha gave birth to Tammy, I was the one who helped her take the newborn to the clinic for regular checkups. We were virtual family for the next few decades. Martha was my closest friend, truly like a sister. We had something else in common. We absolutely didn’t moonlight. I was at first mystified by how my material – especially scoops on the incipient struggle of Soviet Jewry – would make it to the wires before publication in the Post. After a while, I figured it out. Many of our reporters were in the unofficial employ of one news agency or another, and leaked profusely. But not only reporters. One evening I caught Khermoush, whom I’d never remotely suspect, reciting in his distinctive Bombay inflection directly from the tickertape to someone on the phone. Still, I was little girl enough to have contracted the measles during my first year at the Post. Ari nearly blew a gasket when he saw that my doctor’s note was from the politically wrong sick fund – Kupat Holim Leumit. Little girl though I was, I stood my ground and talked back, which launched a prolonged political standoff. But that’s a whole other opera. Great memories and nostalgia, ‘Buttons’. I remember being down by Jerusalem’s Old City, seeing a huge traffic jam right there at the corner, near Jaffa Gate, and witnessing Teddy Kollek come flying out of City Hall to direct traffic and single-handedly clearing up said mess. Just read and thoroughly enjoyed. Voted for Bait Ha Yehudi -much closer to Jabotinsky’s mediniut than Netanyahu’s Likud ! That IS a story to be told dear Sarah ! Hmmmm…Kupat Holim Leumit…must be a good health plan. Yep….I wannabe a Herutnik. I’ll remember that when I come to Israel. I am much older than you. When I tried to get a job teaching English (I had degrees from the US) in 1955 in Jerusalem, I was told that I looked too young (I was 25). Someone told me that Charlie Weiss was leaving his job as Assistant Editor of Karnenu at the JNF, so I applied for the job and got it. I would love to share more stories with you.